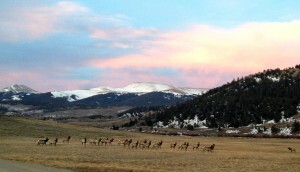 Like the herd of elk I saw in the meadow as we arrived at our cabin, I am moving on. After 9 years of being a full-time Language Arts teacher, I am starting a new chapter. Inspired by a seminar I took at my husband’s last reunion at Yale, I have stopped, reassessed, and recognized that if I don’t pursue my dreams now, they may never materialize. It has not been an easy decision. Today, when I told my 7th grade students, who were looking forward to having me for 8th grade, many of them cried. I am passionate about writing, vocabulary, grammar, reading–all the things I teach. Yet, I have found my schedule increasingly draining. Each day, I expend a huge amount of energy just getting the students to stay focused for our 90 minute classes. It has taken me months of going back and forth, changing my mind constantly, to finally realize that fear of the unknown is not the right reason to stay. The morning after we saw the elk, they were gone.